Unfortunately we have to be in Melbourne on August 6th for Russ to have an operation, bloody prostate! This means we will miss our usual winter sojourn to various places in Australia. So, as we have a few days to fill in, we decided to head to Echuca. We’ve been here many times before and love the place. On our first night, we called in to the famous Bakery and bought a sliced sour dough loaf and a couple of raspberry pastries happened to slip into the bag!! We are trying to watch our weight, believe it or not! Woke up to a beautiful morning and decided to walk into town. The walk from the caravan park is lovely, alongside the river, but with the temperature below 10 degrees, we chose to walk on the sunny side of the street. Decided to have lunch at the Shamrock Hotel, which has the most extensive menu I’ve ever read, specialising in Parmas. Order one, get one free, Mon to Thurs, although we both chose flathead, mine with salad, Russ’s with chips. Tasted locally made cheese and liqueurs at nearby shops, then ambled home. 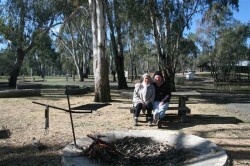 After zero degrees overnight, we decided we needed to snuggle up with a fire, so headed off to Barmah National Park. 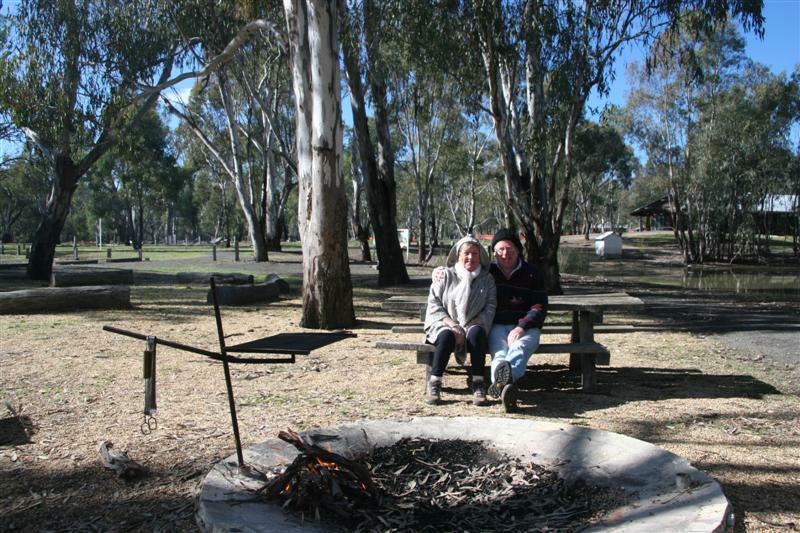 Most of the park is inaccessible because of flooding, but near the (unopen) visitor’s centre is an area set up with tables, toilets and a fire pit. Today, we ordered a platter from Bitemedeli. For $33 we enjoyed pickled onions and pickled cucumber, roasted capsicums, slow roasted tomatoes, marinated mushrooms and eggplant, salami, roast beef, roast chicken, home made ciabatta bread, egg and bacon pie, as well as a wedge of brie and a wedge of very tasty cheese. We have enough left, either for tea tonight or another yummy lunch tomorrow. We had to eat it in the van, as it was very cold, with light rain. With the soothing sound of paddle steamer whistles and the slap, slap of the water, views of the Murray and river red gums, it was a pretty good setting. Russ has had the usual amount of repairs to do, but this time they are problems with fittings that have recently been added, so can’t blame anyone else this time. Sorry to hear what is happening on Aug. 6th. hope all goes well for you Russ. Thanks for your email too, I was wondering what you were up to- now I know. I have been a fanatic on Burke and Wills too for many years, and enjoyed going up their track to the Gulf, and the B&Ws Roadhouse. We cannot imagine what they put up with, but Sarah Murgatroyd’s book on their journey was really good. Is that the one that you have? have you been to the Dig Tree,? it is a magic place there. I better go and stop clogging up wour emails, hope you are both OK.
Just checked our blog and realised that I forgot to mention about the Dig Tree. We have been there and we have a photo of it with Budgerigars nesting in it. The corellas were unforgettable at the waterhole that we camped at. We bought steak from the bar at the only hotel and then cooked our own BBQ in their outside camp kitchen. We loved it. Marg.